Decorative air vents in this Octagon design have a 1/4" thick sand cast faceplate which present a old time feel. These sidewall registers are made by hand in the US by Classic Grilles. The white bronze decorative air vents are similar to a chrome in finish and are coated in a protective lacquer. Our sidewall registers are durable enough to use in the floor as well as in the ceiling because they are made from white bronze. The decorative air vents are available with or without pre drilled screw holes, depending on floor or wall installation. Each sidewall register order will come with screws to make mounting easier. Our decorative air vents have a steel damper attached at the back of the vent to help diffuse air in your home. Order your Octagon sidewall registers all at once to have them ship for one low cost. Tip: These decorative air vents should be ordered by measuring your wall hole opening. Do not order according to measurements of your old vent. The 14 x 12 sidewall register will fit into a hole opening of 14 x 12 inches. Outer dimensions will add 2 inches for mounting purposes but can vary between sizes since these registers are custom made. Important: Our decorative air vents will ship between 7 to 9 weeks after a payment has been made. Each sidewall register is considered a special order item therefore non-returnable and cannot be canceled once order has been placed. 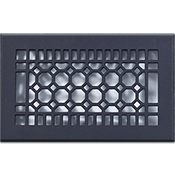 For more decorative air vents by Classic Grilles, just view the other designs on our site. 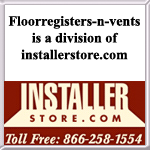 This sidewall register is also offered with a screen backing as an Octagon return air vent. Redesign rooms with decorative air vents that add a touch of class while working to distribute your airflow. Order now!